Part of our water management for the garden is keeping the irrigation water tank filled. We have buried hose lines to various garden plots and installed drip lines. We have nine garden plots that cannot be watered simultaneously, three open lines empty the tank within 45 minutes and it takes an hour and a half to refill the tank. So careful attendance is paid to which plot is getting water and when. 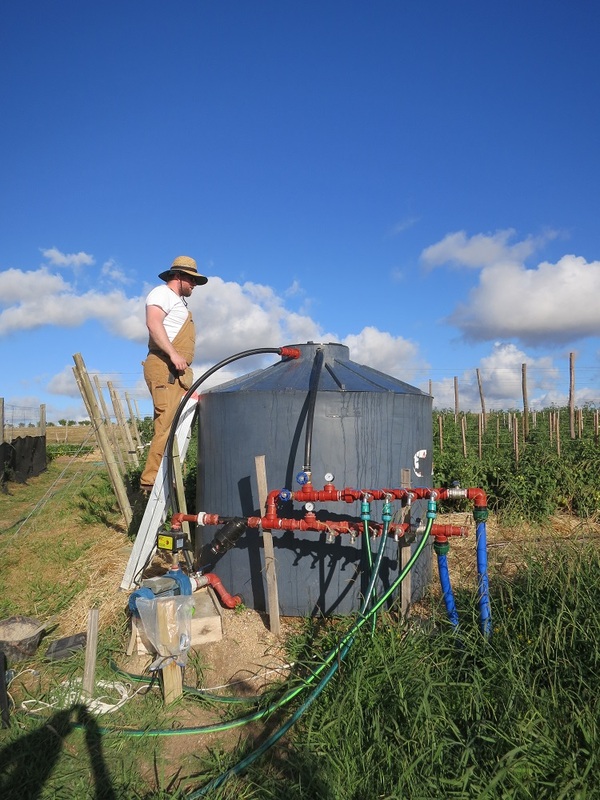 Of course it is best to water in the mornings and the evenings, but we also have to take in account the watering of the trees that have hose lines from the main field tank and those drip lines can drain the main storage thanks rather quickly. Anyway, Jason is visiting. He has listened to us lament over the time it takes to manage the tanks. We walk around with a timer clipped to our shirt to turn the water pump off or on. So for this working vacation, he decided to help us with our water anxieties. The first thing he did was devise a flotation device like a toilet tank to shut off the incoming water when the tank was full. It works just like it was designed!